Make chic, modern, and dynamic photo collages with the Momentsia iPhone, iPod Touch, and iPad app. Your creative energy will flow as you select graphic designs to fill with photos and bright pops of color. The fun, non-linear interface of the Momentsia iPhone app brings an added punch of fun. 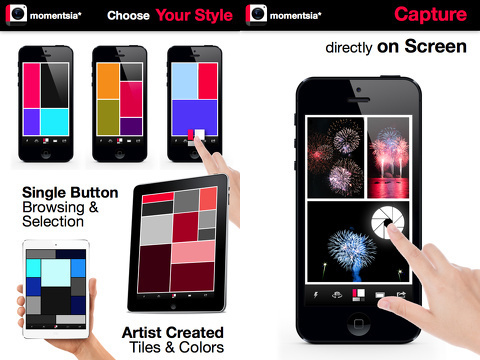 The Momentsia iPhone app home screen is a bold graphic grid of hot pink and black squares. There are directions on the squares to explain the tools and functions. Instead of a methodical, step-by-step process, you can select what you want to do first. This is an unusual choice, but it is extremely successful due to the simplicity of the navigation and incorporation of intuitive gestures. 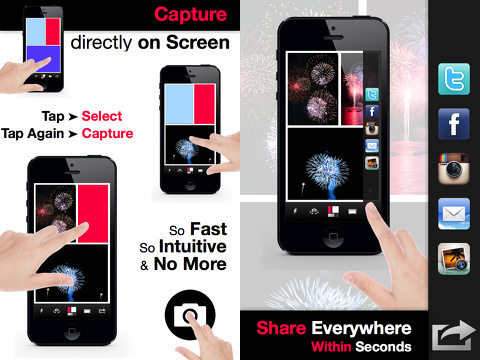 You make your Momentsia photo collage within one clean, yet visually impactful screen. There is a menu bar at the bottom of the screen, and the photo collage grid fills the rest of the screen. You can turn your flash on and off with a touch. You can also turn the camera direction. You can change the interior and exterior border from white to black with a touch. But, the real fun is the middle grid button at the bottom of the screen. With each touch on the matrix icon, the graphic layout and color palette changes. The color selections would make Apartment Therapy and HGTV addicts proud. They are bold, sophisticated, and current. You can leave each square filled with color, or you can tap on the square to open the in-app camera within the square. You simply touch the square a second time to snap the photo. The ability to customize and watch your work in progress is exciting and interesting. The sharing features are accessed with another example of great interface. The share icon at the bottom right corner of the screen leads to a slide out column from the right side of the screen. You can share to Twitter, Facebook, Instagram, and email. You can also save to your iPhone camera roll. The Momentsia iPhone, iPod Touch, and iPad app is a universal download that is solidly worth the $.99 download from the App Store. It is a fun, exciting, and engaging way to express yourself in iOS photography. AppSafari review of Momentsia was written by Jenni Ward on January 4th, 2013 and categorized under App Store, iPad apps, Photos, Universal. Page viewed 3718 times, 1 so far today. Need help on using these apps? Please read the Help Page.